Most of the islands inhabitants are Muslim and so their local customers and festivals are not experienced by the tourists to the island. 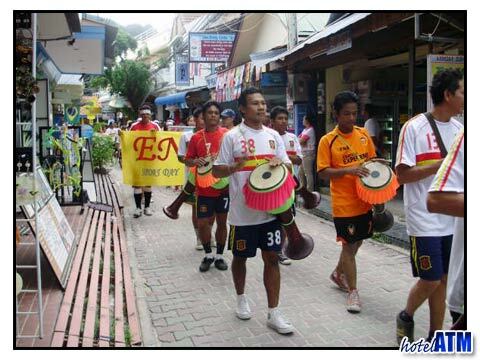 However the local school does a parade every term to high light the importance of keeping Phi Phi island clean. Thai New Year ‘Sawadee Pi Mai’; This is known as the water festival and allows you to sprinkle water on each other as a blessing for the New Year. Many get carried away so bring the water pistols! The kids play and some times it can be raucous so please don't take offence as this is considered a time of great fun and merriment as well as a time to wash away past worries and receive blessings form each other. Loi Kratong Thai Buddhist ‘Forgive and Forget’ ; Small bamboo floats with candles on them are put to sea at midnight on the night of the full moon. Enchanting and magical this is a night to remember with your loved one. King’s Cup; An international sailing event, the King’ s Cup passes Phi Phi Don during their nine-day Regatta. Boats come from all over the region, and sailors from all over the world. This mainly takes place in Phuket since 2007 however there are always yachts here before and after the event. Christmas Day is celebrated by the Swedish with a procession on the 14th December but the biggest party seems to be Christmas Eve. Note: . Phi Phi Hotels at all budgets including the high end luxury hotels will be busy during these festival days as the whole of Thailand will take time to celebrate these festivals. Please also organized tours can be delayed by an hour on Fridays when the boat captains go to the Mosque.